Apparently 21st Century etiquette demands that if you take someone hostage and get into a police standoff, you should keep your friends updated via Facebook. If you took someone hostage, would you brag about it on Facebook? 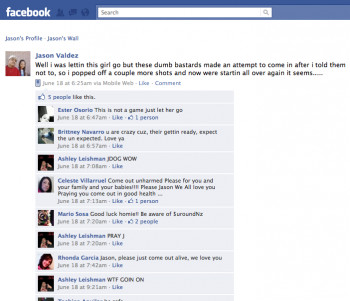 That's what Jason Valdez did while he was in a sixteen-hour standoff with SWAT teams near Salt Lake City, Utah. The man's been wanted by authorities since June 1 after he missed a preliminary hearing for a case where he was being charged with felony and misdemeanor drug possession charges. Somehow, the man's whereabouts were discovered by police; before they could serve him with their felony drug warrant, though, Valdez barricaded himself in a motel room with a hostage and started posting updates on Facebook. All in all, Valdez made six posts and "added at least a dozen new friends." Valdez's first update occurred at 11:23 PM: "I'm currently in a standoff ... kinda ugly, but ready for whatever. I love u guyz and if I don't make it out of here alive that I'm in a better place and u were all great friends." The updates went both ways, actually, like when a friend posted that a SWAT officer was hiding in the bushes outside the room. "Thank you homie," Valdez responded. "Good looking out." Since some of his friends were technically offering him tips via Facebook, authorities are now debating whether or not they should charge these people with Obstruction of Justice. Family and friends made over a hundred posts on Valdez's Facebook wall. Some of them offered him encouragement (or "liked" his updates and the photos he posted of himself and his hostage), while others begged him to "do the right thing." Finally, at 7:25 AM, Valdez made his final post (pictured here): "Well i was lettin this girl go but these dumb bastards made an attempt to come in after i told them not to, so i popped off a couple more shots and now were startin all over again it seems ..."
When officers stormed the room, Valdez shot himself in the chest (no SWAT personnel fired a shot, reportedly) and is currently in critical condition. Meanwhile, his Facebook page is still up for public viewing and has been overrun with comments from family and friends who are defending him, as well as people who are ... Well, let's just say they're less-than supportive of the man and leave it at that. Honestly, this whole story is just too bizarre to be fake. It's also a bit stunning that so many people are defending him, especially since "court records show Valdez has a criminal history, including convictions for aggravated assault and domestic violence in front of a child."